Spring is here and I am busy planning and planting and wildcrafting. One thing I always keep in mind during these seasonal tasks is making my treasured tea blends. Mostly, I grow my or forage my own herbs, but I ammend what I harvest from my herb garden with beautiful organic herbs from Mt. Rose Herbs. Also, the Mt. Rose website is an excellent source of information and inspiration. Take a look through their Herbal Tea Section for some wonderful ideas for tea blends. One of my favorite examples is their Peace Tea. This is a gentle and calming nervine blend; a chance for reflection while providing an opportunity to imagine a peaceful world. Takes the stress out of life for a while. A wonderful infusion drink for meditation and quiet moments. Contains: Organic Chamomile flowers, organic Spearmint, organic Passionflower herb, organic Rose petals, organic Lavender flowers and organic Cinnamon bark. This looks like a delightful blend! 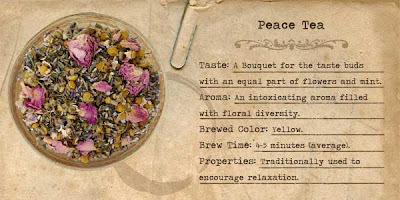 That sounds like a great blend, actually all of mountain rose herbs' blends sound delicious. 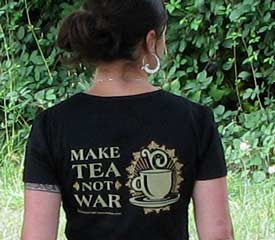 I have never made my own tea, but I would very much like to try. There's this tea that I had a while back, that was absolutely fantastic, called balance by a brand called Oasis. But now I can't find it anywhere else, so I think I'm gonna try and see if I could recreate something like that. The ingredients were: liquorish root, apple, chamomile, lemon verbena, peppermint, coriander and ginger. Fantastic blend! Yum! That sounds like a great blend. I love blending teas! This sounds so nice. I have never made my own tea and am actually trying to start drinking hot tea more. I guess I could start by adding a few items into existing tea? This can be a summer idea for me to do! We drank a lot of herbal tea in my home growing up. Now, as an adult, I find herbal tea holds a special sweetness for me, above even the tea itself. It's about childhood and ritual and all of that. Lovely!